While strolling along the riverfront in downtown Wilmington, NC about a year ago, my husband and I passed a unique Bed & Breakfast. This was not your typical B&B in the southeast. It wasn’t a historic, two-story Victorian home. Heck, it wasn’t even a building. It was a boat! Pretty clever, eh? The owner simply combined two existing products — a sunset cruise and a B&B. It’s similar to the innovative product that came about when Nike and Apple got together to create the Nike + iPod Sport Kit. Genius! All of this reminds me of the William Plomer quote: “Creativity is the power to connect the seemingly unconnected”. I’ve actually noticed that most designers I’ve encountered are born with this skill — the ability to make connections or see patterns. It can be useful when you’re presented with something that appears quite complex. For example, take a manager at an organization. He or she is so embedded in the business that they often can’t see the forest for the trees. Ask him to summarize the functions of the business or a particular process, and you’ll likely get a rather lengthy, detailed response. Well, a designer can step in, do some research and discover the patterns that exist within that system. He or she can then visually communicate that understanding through the creation of a map or model. Yes, that’s right. A process, or even an entire organization, can be represented on one page. From the manager’s point of view, think about how refreshing that would be. To see your entire department on one page. And I’m not talking about a diagram like an org chart — an HR tool that shows a hierarchy of job titles. I’m talking about a diagram that illustrates people delivering products or services to other people — how a company really works. This is what Henry Mintzberg called an Organigraph. And it has proven to be a helpful tool for clients on many levels. 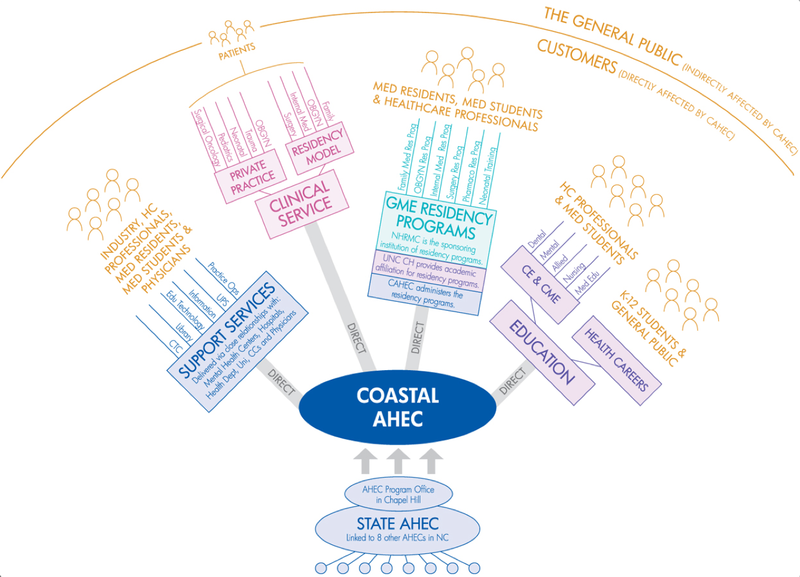 The example shown here is an organigraph of an organization in the healthcare industry. The synthesis that was involved in the creation of this output resulted in a big picture view of the organization, which none of the employees had prior. So it gave them a shared understanding of the business as a whole. In addition to many other benefits, the organigraph became a tool for conversation. So, here’s a challenge. See what million dollar idea you can come up with by connecting two or more things that are really different.